754 million people all over the word use Internet-messenger Viber and the number keeps growing. It became an alternative of bulk SMS-mailing for business as it offers quick and high-quality communication with users. SigmaSMS sends messages via the direct Viber channel, so they do not get into spam and reach the recipients. Low price. With similar volumes mailing via Viber is 69% cheaper than sending SMS. At the same time, there are no additional payments for sending messages abroad. Functionality. The message on the official channel comes with an avatar, “call”/ “go to the site” buttons, an image. The message is sent on behalf of the brand that ordered the service. Legality. The legislation of the Russian Federation does not prohibit Viber mailing. And the direct channel ensures that the message is immediately opened by the recipient. High speed of dispatch. The capacity of 5000 messages per second ensures instant sending of large mailings. Variability. We offer Viber + SMS mailing. The software algorithm determines the Viber users in the downloaded database, and sends a message in the messenger. Other people get the message in the form of SMS. Complete statistics. The system collects the delivery statuses. Track the conversion, evaluate the quality of the database and adjust the marketing campaign based on the results. The size of a message can be up to 1000 characters. Commercial enterprises. 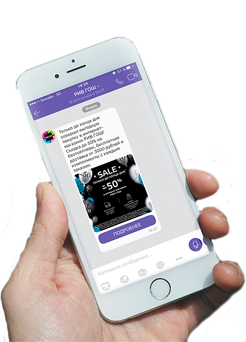 Retail chains, shops, restaurants and cafes use Viber in marketing campaigns. The ability to attach a picture makes the message colorful. The “call” / “go to the site” button instantly turns recipients into customers. The message remains with the client and he can return to it later: it creates delayed conversion. Financial institutions, delivery services, taxis. Viber is an effective alternative to transactional SMS. It costs less but also connects to the API and helps to instantly inform customers about the order status, the taxi arrival or the movement of funds on the account. IT-companies. Mailing via Viber is an alternative to SMS authentication when registering on sites or in services. With the same efficiency Viber messages contain more information, but are cheaper. Outdoor advertising is image advertising. Wide coverage if installed in a right place where many people can see it. Bright and memorable. It has more disadvantages than advantages. There are only 2-3 seconds to inform the client about a brand, unique offer and advantages. It is very unlikely that the clients will return and look at the post again. The price is high. It includes designer’s work, printing, and rent for billboards (other places). Outdoor advertising is expensive and ineffective. Contextual advertising is an effective tool for business promoting. But it works only in the hands of professionals. If you are not ready to study for a long time than you will have to pay a fee to an Internet marketing specialist or agency. The cost of a contact with the customer reaches 100 rubles. Mailing via Viber through the official channel doesn’t have any of these shortcomings. The message comes directly to the client and he can return to it at a convenient time to get the details. Embedded pictures make the message vivid and memorable. Avatar with logo and the company’s name in the “Sender” line clearly identify the company sending out the messages. A button calling to action implies instant interaction. The price for mailing is fixed. The average cost of a message is 62 kopecks, which is a hundred times cheaper than contextual advertising. Fill out the feedback form or call 8-800- 333-16- 50. SigmaSMS manager will contact you, consult you about the rules and features of the mailing. SigmaSMS manager will contact you, specify the details, will help to fulfill an application and start mailing as soon as possible. To start sending messages to the Viber users and turning on “Viber instead of an SMS” function fill the registration form. Please, accurately indicate the data, because the speed of information processing depends on this. Our manager will contact you right after you will complete the questionnaire. He will give the terms of the agreement and the total cost of the mailing.